Admirers of the great poet and philosopher gathered for a function at the Russian capital’s Friendship Park, which has a Tagore statue. On Tuesday, May 7, the Embassy of India, Moscow, commemorated the 152nd birth anniversary of Gurudev Rabindranath Tagore at a function held at the Tagore Statue at Friendship Park, Moscow. 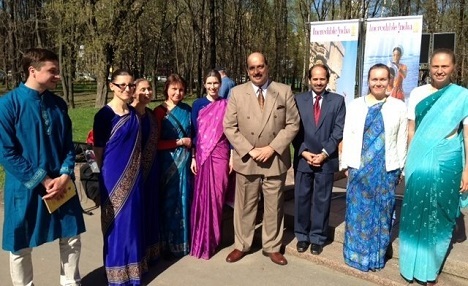 Ajai Malhotra, Ambassador of India to the Russian Federation, was the Chief Guest at the celebration. The Indian ambassador highlighted Tagore’s contribution to education through his school at Shantiniketan and Visva-Bharati Univesrity. Visva-Bharati is a meeting-ground of cultures and a learning centre where students could work together in a common pursuit of truth, Malhotra said, adding that Tagore's ground-breaking educational philosophy may yet emerge as one of his most significant contributions. Gurudev also had a fascination for Russia, which he visited in 1930. Ambassador Malhotra shared a line from “Letters from Russia,” wherein Tagore stated “If I had not come to Russia, life’s pilgrimage would have remained incomplete.” The Indian ambassador described the installation of Tagore’s statue in Moscow in 1990 as a reflection of the tremendous affection and goodwill of the Russian people for Gurudev. He thanked the admirers of Tagore who had gathered to honour Tagore. Other speakers on the occasion were Irina Prokofieva, eminent Indologist & Bengali language expert of the Moscow State Institute for International Relations (MGIMO), Galina Kiriyenko, Director, Tagore Museum, School No.1279, Moscow, and Ludmila Sekachova, Head, “Parade of Cultural Heritage.” They warmly praised Tagore’s multi-faceted contributions to society and voiced admiration for Gurudev and his visionary ideas. Thereafter, Rathindranath Chatterjee, Ex-President, Hindustani Samaj, and Krishna Roy, Member, Hindustani Samaj, recited some of Tagore’s poems. The choir of the Sri Chinmoy Centre, Moscow, sang several Tagore songs, which were enthusiastically applauded by the assembled gathering.